The Giggle Shack Comedy Nights have gone from strength to strength since their first gig in 2017. 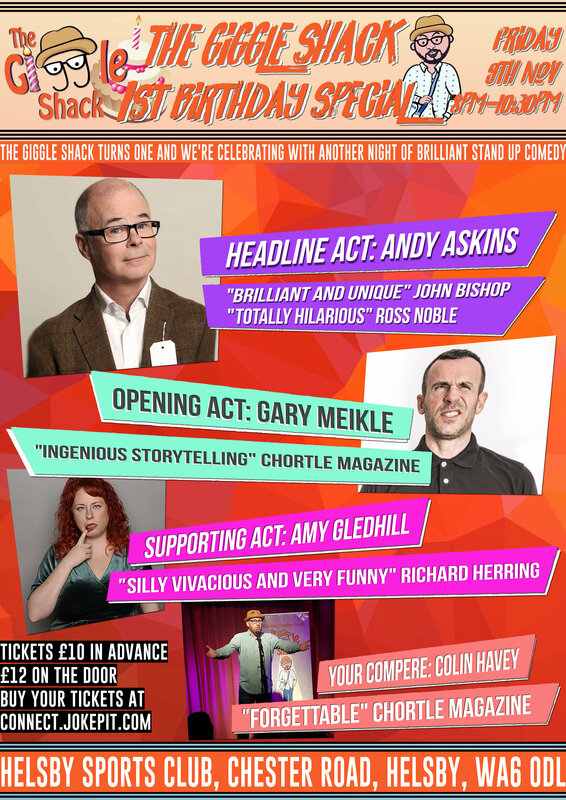 Come and join us as we celebrate our 1st birthday with another night of brilliant stand up comedy. Headliner Andy Askins is one of the most popular acts on the circuit, mixing darkly wicked humour with music and a cheeky delivery. He's Jason Manford's favourite comedian and has appeared on The John Bishop Show, Andy is an act you wont want to miss. Our opening act is Glaswegian Gary Meikle, since starting comedy in 2013 Gary has quickly become one of the most sought after acts in the country, performing at major clubs across the UK. His hilarious tales of everyday life have people hanging on his every word. Support comes from Amy Gledhill, Amy is one half of the amazing sketch group 'The Delightful Sausage'. She's sharp, engaging, silly and absolutely hilarious. Tickets are £10.00 in advance or £12.00 on the door, the only way to guarantee entry is by purchasing your tickets in advance. Line up is subject to change.